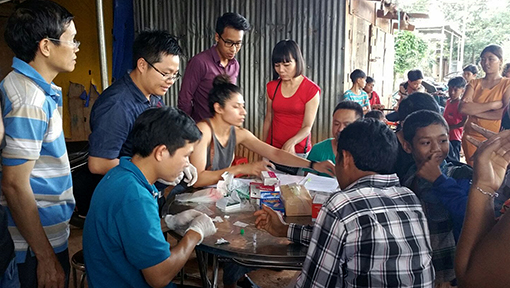 Led by Dr Jack Richards, the Burnet team has been training local scientists and health workers along the Vietnamese-Cambodian border in the use of highly sensitive tests that can detect low levels of malaria. These tests are needed to identify an important group – people who are infected with malaria but don’t know it because they are asymptomatic. These people carry parasites that can be transmitted by mosquitoes to others, and discovering and treating them is now widely acknowledged as one of the keys to malaria elimination. “The paradigm shift for malaria globally is that it’s not enough to find the sick people and treat them – that’s what we’ve always done,” Dr Richards said. “To eliminate we now need to find all the people in the community, and there are lots of them who are infected with the parasites but who are ‘well’ and not yet showing signs of infection. Several Burnet students were tasked with training local health workers in the use of a more powerful and effective test for malaria than conventional rapid diagnostics and microscopy. This test, called LAMP, is a new way of amplifying parasite DNA. This study was to determine how effectively this could be deployed in remote rural parts of Vietnam. The project recently completed LAMP tests on 6200 asymptomatic people and one-point-seven percent of people were infected across the whole study. “That sounds like a small percentage, but that’s what drives transmission,” PhD student Leanna Surrao said. “Behind all the obvious symptomatic people we know that those asymptomatic people who are infected still infect mosquitoes and drive transmission. Earlier groundwork to identify malaria hotspots was another important aspect of the study, and involved mapping more than 11,000 households in the border region. 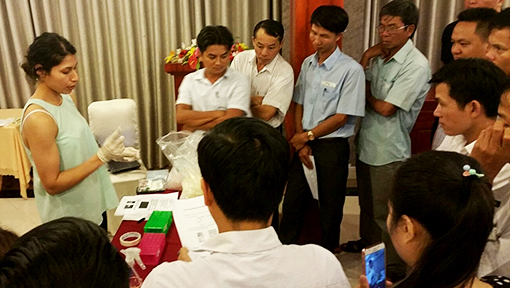 Another Burnet student, James O’Donnell, accompanied staff from the National Malaria Control Program in Vietnam (NIMPE) from house to house to build a detailed register of information – from the number of residents in a house and whether they use bed nets, to where they work and travel. Data entered into a purpose-built app including patient stats from local health clinics provided a real-time visual display of trends and hotspots of transmission – and further opportunities for research. “While we were there, fewer people were coming into the clinics actually sick with symptoms, but the data shows there’s a high proportion actually carrying parasites, and that’s a reservoir we didn’t know about beforehand,” Ms Surrao said. “We identified one village where six percent of the people were carrying parasites but had no symptoms, while in neighbouring villages only one percent of the population were asymptomatic. “With the data available we can look beyond geographical location to explain these findings to include where people are working, or whether they regularly travel through areas where malaria is prevalent. “There are many pieces to the puzzle, but huge benefits in knowing who’s infected and where they’re infected,” Ms Surrao said. “This project has been a huge undertaking,” said Dr Vashti Irani who was also involved in the project. “Scaling-up interventions to this level will be critical if we are going to successfully eliminate malaria. The project was a collaboration between Burnet, NIMPE, Health Poverty Action, and FIND. Funding was provided by Global Funds Regional Artemisinin Initiative. Find out more about Burnet’s innovative and far-reaching malaria research.